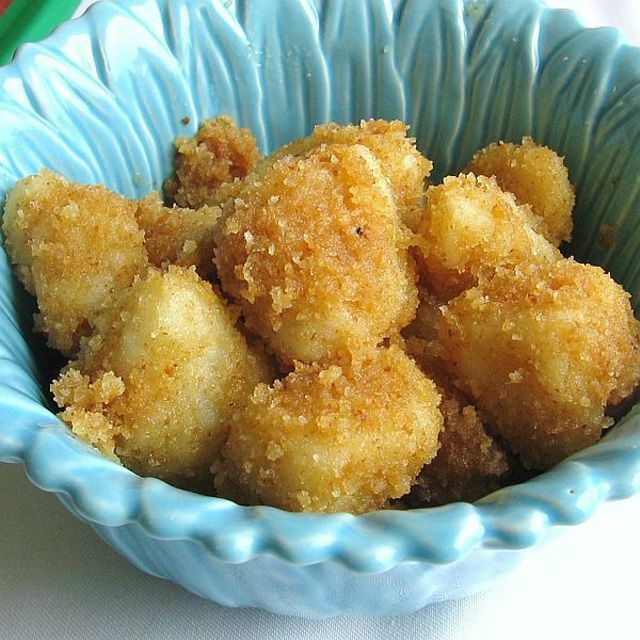 Hungarian-Jewish shlishkas (sometimes called shlishkes) are dumplings made with riced or grated cooked potatoes so similar to Italian potato dumplings, we call them Eastern European gnocchi. They exist in almost every Eastern European culture. In Poland, they are known as kopytka and often served with bacon and onion, and in the Czech Republic, they are called Bramborove Knedliky ze Studenych Brambor. Hungarian-Jewish mashed potato dumplings are typically served with bread crumbs toasted in butter or onion fried in schmaltz (rendered chicken fat). Most cooks boil the potatoes in their jackets for this recipe, but we peel ours and cut them into chunks before boiling because it eliminates peeling hot potatoes. The critical factor in making these dumplings light and fluffy is to rice the potatoes while they are still warm. Don't mash them and don't use a food processor. If you don't have a ricer, grate them. And don't overdo it with the flour when rolling. These dumplings can be made ahead and frozen uncooked. Then drop as many frozen dumplings into boiling salted water as you like. Just cook them a little longer than fresh dumplings. In a large saucepan or Dutch oven, boil potatoes in salted water until tender. Drain and allow to cool a few minutes. Immediately rice or grate warm potatoes into a large bowl. Add beaten egg, salt and flour and mix together with a wooden spoon or by hand until thoroughly incorporated. Cover loosely and let stand 15 minutes. Place a large saucepan or Dutch oven with salted water on to boil while you form the dumplings. On a floured surface, take a portion of dough and roll it into a long pencil shape about 3/4-inch thick. Cut 3/4-inch slices and drop into boiling water. When the dumplings rise to the surface, they have finished cooking. (If you like your dumplings a little chewier, continue to cook 2 minutes after they rise to the surface.) Remove them with a slotted spoon and place in a buttered bowl. Repeat with remaining dough. In a large skillet melt the butter and toast the bread crumbs. Drop the cooked and drained dumplings into the buttered bread crumbs, coating well. Serve immediately. Are You Familiar with Strudla s Kupusom? How Do Croatians Celebrate Easter?